Planning a kosher meal for the first time? Here are some basic guidelines. Please note that these are general rules, not definitive—an Orthodox Jew is going to be much more strict about observing food laws, and this list would not be broad enough to include all of their special needs. –Certain meats must not be consumed. Forbidden meats include (but are not limited to): pork, rabbit, camel, shellfish, lobster, shrimp, crab, seafood without fins or scales (like swordfish and sturgeon), birds of prey, scavenger birds, tortoises, bats, snails, reptiles, rodents, and any animal that has died of natural causes. I’m guessing you didn’t have rodents on your dinner menu, but thought I’d mention it anyway! The restriction includes all parts of the animal, including eggs and milk produced by the animal. So sorry, no snake eggs for breakfast. –Permitted animals must be ritually slaughtered in accordance with Jewish law to be considered kosher. An animal must have no diseases or flaws. Certain parts of permitted animals are considered non-kosher, including the sciatic nerve and the fat surrounding animal organs. 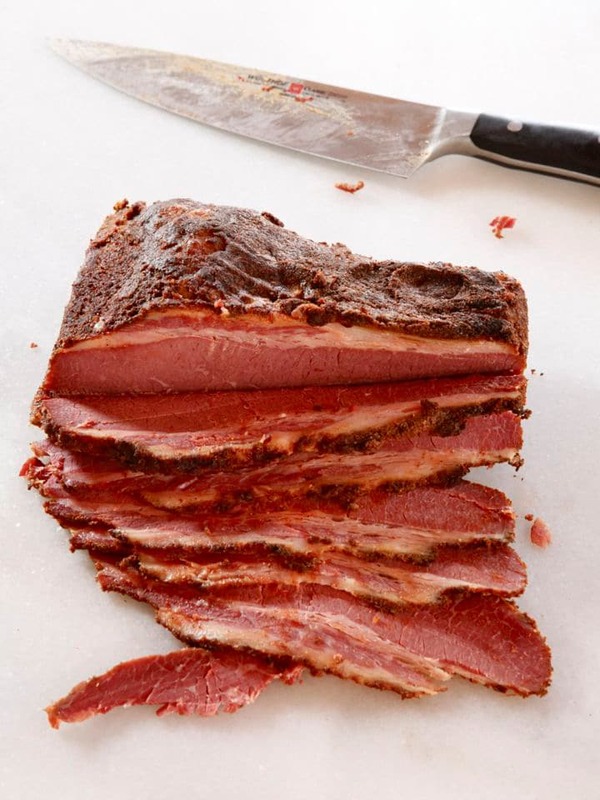 Glatt kosher means that the lungs of the animal have been inspected for adhesions (i.e. cancer). If no adhesions are found, that animal is designated glatt. You can find kosher meats through most Middle Eastern markets or kosher butchers. Some grocery store chains have started carrying kosher products as well. Kosher meats have actually become more popular in recent years, due to the exacting standards that kosher slaughterhouses must adhere to in order to produce truly kosher meat. –Kosher meat must be rid of as much blood as possible. This one makes me squeamish! However, it’s important to note that kosher meat is drained of as much blood as possible prior to cooking. Kosher cooks will further kosher a cut of meat by salting it to draw out any leftover blood. Kosher salt was invented for just this purpose. –Meat cannot be eaten in combination with dairy. However, fish and/or eggs with dairy are permitted. Some Sephardic traditions do not mix fish and dairy, but there is no Torah law forbidding the practice. Kosher Jews will wait 3-6 hours between a dairy meal and a meat meal, in order to fully cleanse the system. Dishes and utensils used for meat must not be used for dairy, and vice versa. –You may have noticed that some kosher foods are marked with the symbol Pareve. This means that the food contains neither meat nor dairy. Pareve products can be paired with either meat or dairy—they are considered neutral. –Fruits and vegetables are considered kosher, but they must be inspected for insects. If any bugs are found inside of a fruit or vegetable, it is no longer considered kosher. This includes food dyes and additives made from insects. –Grape products are not always considered kosher. Wine, grape juice, and other grape products can only be consumed if they’ve been manufactured under Jewish supervision—e.g. kosher wine. –The holiday of Passover has additional dietary restrictions, including a restriction on leavened products (like bread). Steer clear anything made from wheat or wheat flour, barley, rye, oats and spelt. Some Ashkenazi Jews also restrict peas, beans, corn, rice, and other small legumes or grain-like foods. This list might sound kind of limiting, at first. But remember, most Jews today do not observe all the kosher laws, unless they’re Orthodox or strictly Conservative. And you must admit that many of these rules make perfect sense… like the one that says you can’t eat rodents or reptiles. I don’t know about you, but that’s one kosher law this Shiksa is happy to follow! Did you make one of my recipes? Tag @toriavey on Instagram or Twitter… I want to see! Subscribe for my free recipe newsletter and get instant access to my eBook – 10 Easy Dinner Recipes! Please read through the entire post and comments section before asking a question, as it may have already been answered. First time commenting? Read the comment policy. Check here to sign up for my free recipe newsletter and site updates! How to make Middle Eastern keftes de espinaca. Fried vegetarian spinach potato patties. Fill your home with gorgeous, colorful peonies – the drama queens of spring! Home decor inspiration from Brenda Ponnay. © 2010-2019 Tori Avey · All Rights Reserved.